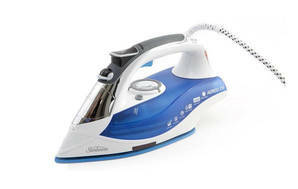 Snapshot: NOTE: Sunbeam has recalled some of these irons because they could cause an electric shock. See our recall notice for more information. The Sunbeam Aeroglide Rapid SR6370 iron has a ceramic soleplate and weighs 1.3kg. But how well did it cope with the creases in our wide range of fabrics? Excellent on silk, wool, cotton, denim. Temperature control is OK to adjust. * The water level is not easy to see. In July 2017, Sunbeam recalled some of these irons because they could cause an electric shock. See our recall notice for more information. 24 Feb 2018, Dave K.